What is the energy of life? Where does it come from? How do you increase it? For centuries, philosophers, scholars and scientists, blinded by their own fixed ideas, could find no answers. A case in point was an early 1950’s experiment at a prominent American university to measure energy fields surrounding the human body. If their “man from mud” theories were correct, those fields would emanate from individual cells. Yet they did not. The energy had a mysterious single point source. And while those results were hastily swept under a scientific carpet, their significance was not lost on one man. The year was 1952. L. Ron Hubbard, then residing in Phoenix, Arizona, had just completed his investigations into the full scope of Man’s past and published his findings in Scientology: A History of Man. Using the first E-Meter, he had charted the whole track, establishing that Man was not a limited one-life being, but an immortal spirit whose past stretched to infinity. Yet while religion had spoken of the soul or spirit for millennia, no one had ever isolated and measured the energy of life—its kilowatts, ohms and amperes. Accordingly, Mr. Hubbard began his investigation into the electronics of human thought and beingness. By September 1952, he had the answers. Before departing for England to establish the first European Scientology organizations, L. Ron Hubbard presented Phoenix Scientologists with a limited manuscript edition of a new book, Scientology 88. Next, reaching London in mid-September and establishing Britain’s first professional school at 163 Holland Park Avenue in London, he began 20 hours of evening lectures. The textbook was the completion of the work that had begun as Scientology 88, now published as Scientology 8-80, The Discovery and Increase of Life Energy in the Genus Homo Sapiens. Through the course of his lectures, Mr. Hubbard revealed all he had learned about theta as the Source of Life Energy—exactly how a thetan creates energy, forms matter and postulates space and time. He also detailed all of the energy phenomena of the thetan—flows, dispersals, ridges, explosions, wavelengths, tractor and pressor beams. While to cap it, he further explained his overriding method of research—the method with which he had arrived at every discovery of Dianetics and Scientology: The Q List, the highest echelon of knowledge from which all else is derived, and the Logics, methods of thinking and the organization and alignment of data. In sum, these formed the linchpin to an understanding of both Scientology and life itself. 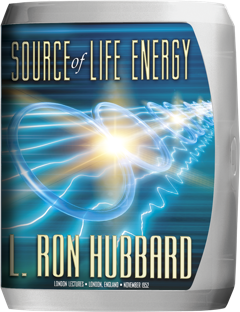 Here, then, are L. Ron Hubbard’s legendary lectures revealing the complete energy phenomena of the human spirit.